The first night amount is non refundable. In case of no show the hostel charge the first night amount. Over 10 persons, we will ask the guests to prepaid the first night amount. The first night amount is non refundable. The remaining amount will be paid on spot. Brand new and stylishly designed, modern and comfortable hostel in the heart of Budapest. All the rooms are air conditioned and they have private bathrooms. Insane parties everyday and free entry for our guests to the club of the building which is the most famous clubs in Hungary (Morrisons2). 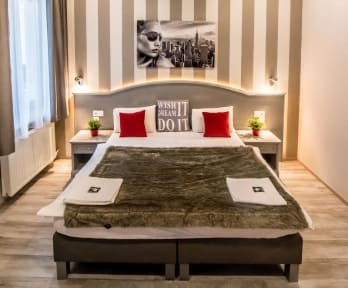 We are located in the center of Budapest, just opposite the Vigszinhaz Theatre, near the Nyugati railway station and West End shopping center, 5 minute walk from both Parliament and Margaret Island with public transport available less then twenty meters from the front door. From our location you can get easily to all the famous monuments of Budapest. We are surrounded by cafes, 24 hour shops, pubs, restaurants, pharmacies, a post office and supermarkets. There is a club on the ground floor of the same building as the hostel. It is super noisy all night long and each night of thebweek. As you have to slam the door to close it, this also participate to the noisy ambiance, on top of the big street full of car in front of the hostel. You wont rest here. I was also not happy with the cleanliness. At my arrival, the carpet in my room was smelling Vomit. I stayed 6 nights, I asked twice the personnal to bring me clean bedsheets and they never did..
Organisation lamentable. Très mauvaise gestion des chambres. Extrêmement déçu comparé aux avis donnés précédemment.